I have given multiple talks about advanced mathematics and the teaching of mathematics at the University of Kentucky, Indiana Wesleyan University , the Indiana section of the Mathematical Association of America meetings, conferences for the Association of Christians in the Mathematical Sciences, and at the national Joint Mathematics Meetings. Please reference my Curriculum Vitae . 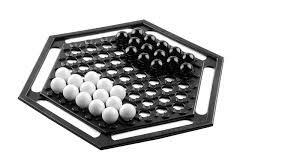 Student Luke Hayden did a combinatorial and proof-based approach with the board game Abalone, pictured below. More information is coming soon, as we are polishing a paper to submit for publication. Student Matthew McAndrews constructed a previously unknown graph. He worked with simple, connected, unit-distance graphs related to a famous unsolved math problem. Some of Matthew's graphs are pictured below. Student Tyler Carrico calculated the probability that randomly chosen sets of elements from certain types of mathematical groups would generate those groups. Tyler's article is published in Involve: a Journal of Mathematics, a respected journal of original mathematical research for both undergraduate and graduate students. Below, I am with Tyler at a national Joint Mathematics Meeting, where he presented a poster on his research.